Pope Francis said dialogue, and not “fruitless” displays of force, will help bring peace to the Korean peninsula, as he began a five-day visit to South Korea. Despite the Vatican’s objections, Beijing insists on maintaining a state-controlled Catholic church, which does not answer to Rome. There is also a large underground church, and the two sides disagree over which has the authority to ordain priests. South Korea boasts about five million Catholics and is one of the church’s fastest growing congregations in the world. Soon after crossing into Chinese airspace, Pope Francis dispatched a telegram to President Xi. “I extend the best wishes to your excellency and your fellow citizens, and I invoke the divine blessings of peace and well-being upon the nation.”On the face of it, the telegram amounted to little more than diplomatic niceties. The pope traditionally sends a telegram to the governments of the countries he flies over. On the Rome-Seoul flight, he sent no fewer than nine of them, one for each country he traversed. But the case of China is a special one. The last time a pope traveled to East Asia, when St. John Paul II flew to the Philippines in 1995, Chinese authorities denied permission to fly over their territory, forcing the papal plane into a long detour. This time, Beijing allowed Pope Francis to fly over China. The gesture is significant, particularly in light of the especially poor state of relations, which have hit a low in recent years after Chinese authorities placed a Catholic bishop under house arrest. Pope Francis is interested in Korea, China, and all of Asia. Because of prophecies in the Book of Revelation, I have long suspected that the time for some reconciliations between North and South Korea would take place. Perhaps Pope Francis, despite North Korea’s actions, will be a factor. 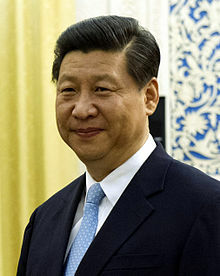 Interestingly, last week a Chinese official stated that China intends to make some provision for the Catholic/Protestant faiths as long as such a theology integrates the religion with Chinese culture in a manner that is compatible with the country’s socialist beliefs (see China moving toward one world religion! Pope to conduct mass in South Korea). The timing, coming so close to Pope Francis’ trip, may not be coincidental. 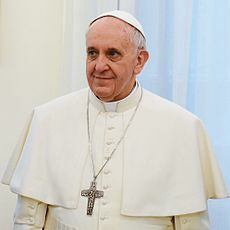 Pope Francis has made many statements that can be considered compatible with socialist beliefs. That is something the Chinese leadership would tend to like. Pope Francis has also made a variety of interfaith statements, which may have somewhat soothed China’s concerns about him and his agenda. The agenda to create strong cooperation and bonds between peoples around the world, so that all we be part of a one-world endorsed religion with the top leader in Rome. While the Chinese would not seem to be interested in that, the leaders in China want more acceptance on the world scene and will tolerate some of this now. The Bible reveals that after signs and lying wonders (2 Thessalonians 2:9-12), the bulk of the world will worship to one in Europe (Revelation 13:1-4,8). This worship would also include the Chinese. The Chinese even have prophecies that they will look to the West in the latter days (Pui-Hua R. Ancient Chinese Prophecies Till the End of the World. AuthorHouse, Bloomington (IN), 2008, p. 85). Steps for the one-world religion are taking place. A few such steps even took place today. This entry was posted on Thursday, August 14th, 2014 at 2:45 pm	and is filed under Religious News.